Designed and manufactured following the quality standards EFFETI generating sets of IDRO-BA series, combine in itself: strength, safety and reliability with a simple design that is well suited to all your needs. Sturdy and reliable generators of IDRO-BA series are equipped with: diesel engines operating at 1500giri / minute cooled WATER, primary national home alternators and electric command and control completely designed and assembled by EFFETI. Being able to provide a customized product at the same price of a standard, to provide endless alternative technical solutions on our products, it is a concrete commitment that has always EFFETI has towards its customers. For this love to put at your disposal all our experience and our production capacity, to design together with you your generating set, always customizing and configuring it according to your needs. Water-cooled, 1500 rpm diesel engine. fitted with a state-of-the-art “EASY MAINTENANCE”. Noise 68dB(A) ± 3 at 7 meters. Water-cooled. 1. STANDARD: ordinary maintenance package for the years following the purchase. 2. EMERGENCY: fast response, with intervention at the customer's site. 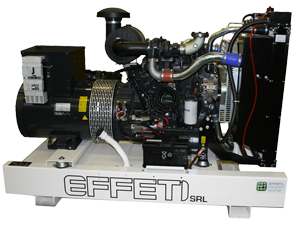 Effeti designs and manufactures customized power solutions in the form of power generators for the most important Italian companies in the railway, marine and aviation industries. In addition to the well-established production of power generators for the most important Italian companies, the EFFETI team takes care of the scheduled or emergency maintenance of all machinery used by its customers. Effeti has been ISO 9001 certified since 1998. The company has always ensured consistent quality levels in its products.